Moving Locally Within The Salisbury Area? Moving To Salisbury? We Can Help! We are a local removal company, and have helped people to move to all areas around Salisbury including Winterbourne, Woodford, Tidworth, Andover, Warminster, Shaftesbury, Fordingbridge and across Wiltshire. Why use Schepens for removals to Salisbury? Schepens has been providing removals for over a century. We are frequent visitors to this beautiful city and, over the years, we have built an enviable reputation for being the most reliable, honest, and trustworthy removals company in the Salisbury area. We are an established removals company in Wiltshire, providing removals to Salisbury throughout the year. The frequency of our removals work in Salisbury means that we are able to offer our clients ‘part load removals’ to reduce their costs. All our removal teams pride themselves on their local knowledge of the city, facilitating excellent navigation and parking. All Salisbury removals utilise our state-of-the-art vehicles and BAR trained, uniformed drivers. Each vehicle is fitted with air ride suspension, security systems, temperature and humidity controls, and an adjustable barring system. We carry full liability insurance and every employee and vehicle is also full insured. In preparation for clients’ removals we offer a range of cargo insurance plans to choose from. Should your cargo be damaged in the course of the move, Schepens will priotitise their management of the insurance process for you. Our teams of professional, uniformed removers have all been trained according to the British Association of Removers standards. The training represents the industry benchmark for all areas of removals, including customer service. Our adherence ensures a a safe and efficient removals experience. We are also able to provide safe, secure and clean storage within easy reach of Salisbury on a short or long term basis. Winterbourne, Woodford, Tidworth, Andover, Warminster, Shaftesbury, Fordingbridge and across Wiltshire. If you need a removals company in Salisbury, then Schepens has the experience, expertise and local knowledge to offer you a smooth, trouble-free move. Salisbury is a beautiful cathedral city located in Wiltshire county. It is one of the largest settlements in the Wiltshire county and has begun to rapidly expand in the past few years. People move to Salisbury for a variety of reasons including the stunning natural environment, the friendly locals, the incredible architecture of the city and the bustling economy. If you are moving to Salisbury this year, choose a removals company who know the area well — like Schepens! Based in Landford, we have been performing domestic removals in Salisbury for more than 100-years and know the city intimately. Our removers love helping people move to this beautiful little city, it is such a lovely location! This article will explain why so many people have begun moving to Salisbury. Then, we will highlight the reasons why you should consider Schepens for domestic removals to Salisbury. Why has Salisbury become so popular? Salisbury is surrounded by some of the most picturesque scenery in the United Kingdom. It sits on the confluence of five rivers, which gives residents plenty of opportunities for rowing, swimming, boating and riverside walks. The city itself is packed with incredibly architecture that dates back centuries, including the magnificent Salisbury Cathedral.There are some incredible historical sites close by, including Old Sarum and Stonehenge. Residents also get to enjoy the many small villages that are just outside the city — they are the perfect places to visit for a day trip. You can enjoy the incredible fresh produce that each village produces, including local wine, ale, and cheese. If you have children and are thinking about moving to Salisbury, you will be delighted to learn that the schools are excellent. The best schools in the city include St Osmund’s Catholic and Woodlands, St Mark’s CofE, Bishop Wordsworth Grammar, St Andrew’s CofE Laverstock, St Martin’s CofE, and South Wilts Grammar for Girls. Salisbury is an affordable place to live that benefits from a low unemployment rate, high wages, high-quality food, affordable property and a low crime rate. Residents also enjoy a great public system, excellent restaurants, and some of the best pubs in Wiltshire. If you enjoy the arts, you will love the excellent museums, art galleries, cinemas, and concert venues in Salisbury. The city also has a strong sporting culture, with strong cricket and football teams. Despite Salisbury being such a desirable place to live, property remains quite affordable. The average price for a semi-detached property is £264,502 and the average price for detached properties is £411,654. 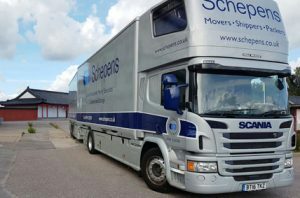 Why Use Schepens for Domestic Removals to Salisbury? The answer is simple — Schepens has the right combination of local knowledge, skills, and experience to make domestic removals in Salisbury simple! Our 4th-generation, family-owned company has been perform domestic removals to Salisbury for more than 100-years! We have developed a reputation for being the most reliable and trustworthy Salisbury removalists. Our team regularly helps clients move to Salisbury. With our fantastic local knowledge of Salisbury and the transport routes into the city the frequency of our removals to Salisbury allows us to offer clients flexible delivery schedules and part-load removals. All domestic removals to Salisbury are performed using our state-of-the-art removals trucks. Our fleet is much newer than other Salisbury removalists and consists of specialised vehicles designed for hauling cargo over long distances. All vehicles feature an adjustable barring system and air ride suspension to keep your cargo safe. They are only driven by trained professionals and all vehicles have security alarms. Clients get to choose from a number of different possessions insurance options, designed to suit all budgets. All vehicles and personnel are fully insured by Schepens. Liability insurance is also available. In the unlikely event that something goes wrong during your removal to Salisbury, your move coordinator can handle the insurance paper work on your behalf. Schepens employs talented removers who are trained to British Association of Removers standards. Our adherence to these standards ensures that every removal to Salisbury will be performed efficiently and safely. Schepens offers clients an optional professional packing service to make the move to Salisbury even easier. The service involves our highly trained removers packing your possessions for you. This approach can help you save a great deal of time and ensures your fragile possessions are packed appropriately for the journey. Our customer service is of a much higher standard than other Salisbury removalists. We treat customers as if they were a close friend of the Schepens family — with great respect, friendship, and dignity. Our team won’t be happy unless you are completely satisfied with your removal! Schepens have the talent, experience, and local knowledge to make any domestic removals to Salisbury simple! Contact us today on 01722 730010 to get a free, no-obligation quote. With over 100 years experience of offering local removals for Salisbury, Schepens always deliver efficient, reliable and friendly removal services to homeowners in and around Salisbury. As a trusted family business, we are able to provide a tailor made service to all of our customers throughout Wiltshire and beyond. We understand that moving house can be an extremely stressful time for you and your family, which is why we work hard so that you don’t have to. We can assist with every aspect of your Salisbury removals and will be with you on the day to ensure that your house move goes smoothly. Our fleet of clean, modern and alarmed transportation vehicles will keep your possessions safe as they journey from one home to the next. See transport, coupled with our extra strong packing boxes and professional removers, will ensure that your treasured belongings are not lost of damaged during transit. We are a first class Salisbury removals company with plenty of expertise and experience to ensure that your domestic or commercial removals go to plan. We also offer tailor made quotes and our friendly and helpful staff will assess your exact requirement before providing you with costs and confirmation. We work hard to help you move, making Schepens Salisbury movers with a difference. THE HISTORIC CITY OF SALISBURY – A GREAT PLACE TO LIVE. Surrounded by stunning Wiltshire countryside, the city of Salisbury offers a wealth of historical buildings and a glimpse into it’s prestigious past, including the Magna Carta that in housed in the world famous Cathedral. As you would expect from a city with so much history, there is a wide variety of traditional and period properties available within the city centre and surrounding areas. Because Salisbury is a town that is continually growing, there are also numerous modern developments to be found throughout the area, making Salisbury a great place to move to. “I’d just like to offer a very sincere and heartfelt thanks to Schepens and in particular, the guys that physically moved our belongings from Salisbury to Crimchard. House prices in Salisbury are slightly above the national average for the UK, with the average price for a 3 bedroom semi-detached home being around £298,000, while detached houses usually reach an average sale price of £434,000. For families looking to move to the area, or relocate from one area of the city to another, there are plenty of good schools to choose from in Salisbury. The majority of primary schools in the area are officially rated “good” by Ofsted, while some secondary schools are considered to be “outstanding”. The most sought after schools in the area include Greentrees Primary School, Bishop Wordsworth Grammar and the South Wilts Grammar for Girls. 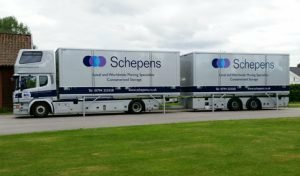 SCHEPENS HAVE THE EXPERIENCE AND KNOWLEDGE OF WILTSHIRE TO MAKE THE MOST EXPERIENCED STORAGE &REMOVAL FIRM FOR SALISBURY! CONTACT US TODAY ON 01722 730 010 TO GET A FREE, NO-OBLIGATION QUOTE. It’s always a pleasure to work in the cathedral city of Salisbury, located in the beautiful county of Wiltshire and Schepens family-run removals service is proud to have been based and operating in and around the area for over a hundred years now. Whilst the business has grown over the century, we still take a particular pride in the highly professional furniture and house moving services we offer in our local area which includes Fareham, Southampton, Bournemouth, Romsey and Winchester. Knowing the locale well, over a number of years, also helps us to provide important information to our customers with regards parking, access, school-run snarls and rubbish-collection times and routes; we’ve found that these small details can make all the difference when helping to plan your move. We have built our reputation as a preferred Salisbury removals business on local recommendations and word of mouth, which means that customer service is at the heart of every job we take on. We also value the feedback we receive because it lets us know what we’re doing right, and where we can improve. In the vast majority of reviews our customers value particularly highly the friendliness and politeness of our removals teams, and the hard work they put into ensuring that the move proceeds efficiently and punctually. The helpful support provided by our administrative team is also highly commended, as is the professionalism and care provided in the early stages of planning and assessment. As trusted house movers in Salisbury we always take our responsibilities to our customers very seriously, and we’re delighted to see their comments demonstrating that our efforts are appreciated. We offer a small moves service which is popular with students leaving home for the first time and moving into student accommodation. We work with older families who are moving into residential care, or smaller sheltered housing flats, requiring a dispersal of furniture items to family members far and wide. We specialise in the removal of large and awkward furniture items such as pianos, or heirloom furniture, which require careful handling and specialist transport options. Schepens provides a professional removals service in Salisbury, with friendly BAR trained staff and a fleet of reliable, alarmed vehicles to help your family move through their lives smoothly and successfully. SCHEPENS HAVE THE TALENT, EXPERIENCE, AND LOCAL KNOWLEDGE TO MAKE ANY FURNITURE REMOVALS IN SALISBURY SIMPLE! CONTACT US TODAY ON 01722 730010 TO GET A FREE, NO-OBLIGATION QUOTE. ARE YOU MOVING TO SALISBURY? We would not be the least surprised that anyone would want to move to Salisbury, as we have an office in this fine city ourselves. That makes us uniquely qualified as movers to Salisbury from wherever you happen to be in the UK – or for that matter in the world. We have moved people to and from the UK all over the world, including Australia, China, USA, UAE and pretty much everywhere in between. Salisbury is a wonderful, and typically English city with its’ grand cathedral which was completed in 1258. It has the tallest spire in the country, at 403 feet, and the world’s oldest working clock dating from 1386. The painter John Constable painted several pictures of the cathedral and surrounding countryside. British Prime Minister Ted Heath chose Salisbury for his retirement home, which is in Cathedral Close and is now a museum. Salisbury is set in a valley and has rivers which flow through the town. There are four shopping centres, and there are markets on Tuesdays and Saturdays which have been held since 1227. The city holds an international arts festival in late May and June which features theatre, live music, dance, street performances, sculpture, and art exhibitions. There are several art galleries in the city, together with Salisbury Museum. On the sports front, the city has a football club, a well-known rugby club, three cricket clubs, a hockey club, a leisure centre and swimming pool, a snooker club, and for lovers of horses there is Salisbury Racecourse. The city has many pubs, and there is also a theatre and Salisbury Arts Centre, so there is plenty for all to do. 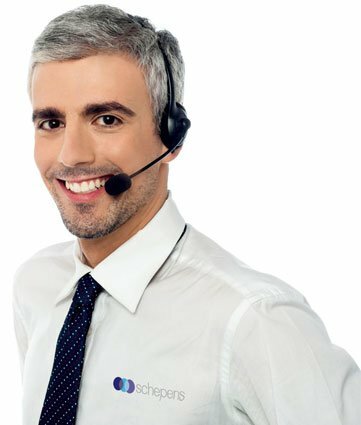 I’d like to thank Schepens for the excellent service provided during a complex move and, in particular, to recognise the superb performance of your staff. To a man they were hard working, tidy and cheerful and nothing was too much trouble for them. The fact that we did not suffer a single breakage (not even a crack to the 50 or so large stem glasses!) is testament to their diligence in packing carefully and safely. We have been hugely impressed throughout the entire process and offer our sincere thanks to you all. Originally from Belgium, the Schepens family moved to the UK in the 1900’s and the company is still run by the fourth generation of the family. As the leading self and business storage and furniture removal company in Salisbury every member of our removals staff is trained to BAR standards as you would expect from a company with such long experience in handling house removals to Salisbury. Moving home can be a nerve-wracking experience since it is not something that most people undertake very often, so we will take you through the whole process step by step. A member of our team will visit your home and undertake a complete survey of your contents and everything that is to be moved, making a special note of any items such as paintings, delicate ornaments, or antique furniture which need specialist care during transport to the city. Our expert removalists will pack your items with extreme care and to the standards laid down by BAR to ensure that nothing untoward can happen to them during removals for Salisbury. When you use Schepens, the long-standing furniture moving company in Salisbury, you can be safe in the knowledge that the contents of your home or business are in good hands. On arrival at your destination in the city, our team will carefully unpack all your items and place them in the correct rooms according to your instructions. As movers to Salisbury, we take pride in in giving you a stress-free removal so that you can enjoy your first day in your new home. Schepens can make your move to Salisbury a simple and straightforward experience. If you would like to learn more please call us today on 01722 730010 to get a free, no-obligation quote or click on the Contact link at the top of the page.